Skirt steak is a juicy, flavorful cut of beef that doesn't need too much fuss, and this grilled skirt steak recipe is perfect for a busy weeknight since the seasonings are simple and preparation and cooking time is quick. A mixture of soy sauce, garlic, and cayenne pepper make up the marinade, and a nice dose of salt and pepper is added before the meat hits the grill. Skirt steak is a flat, long piece of meat, that although filled with connective tissue and therefore a bit tough, takes on a marinade nicely, with the meat's loose structure allowing for a good absorption of flavors. Because it is a tougher, thinner cut of meat, skirt steak benefits from a short cooking time over a high heat. In a large mixing bowl, combine all the marinade ingredients and whisk together thoroughly. Add the skirt steak and toss in the marinade until all the pieces are coated evenly. Cover the bowl and let sit at room temperature for 20 minutes. Remove skirt steak from marinade and pat dry with paper towels. Season with freshly ground black pepper and kosher salt. Preheat an outdoor grill or grill pan to high heat. Cook the steak about 3 minutes per side for medium-rare. Let rest for 5 minutes before slicing. Be sure to slice against the grain for the tenderest results. Because skirt steak is so thin, it doesn't need too long in the marinade, so 20 minutes to a half an hour will suffice (although you can marinate overnight if desired). Make sure to pat the steaks dry after removing from marinade to assure a nice crust when grilled. Once the steak is cooked, it is very important to slice it thinly against the grain; since it is a tough cut of meat, cutting it this way will ensure that each bite is tender and juicy. Because most skirt steaks are long in length, it is easier to cut each piece into sections before slicing. To make slicing simple, be sure to let the meat rest for at least 5 minutes first, and use a sharp knife when cutting. Skirt steak is most often grilled and ideal to use when making fajitas and steak tacos as the flexible slices fit perfectly wrapped in a soft tortilla. 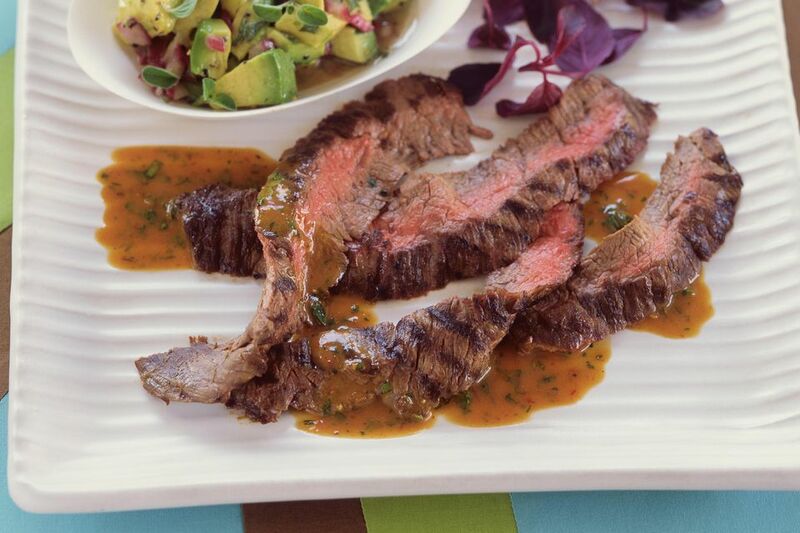 Try this cut of meat with a zesty citrus marinade that includes the juice and zest of oranges and lime, as well as soy sauce, honey, and chipotle peppers in adobo sauce. Skirt steak also benefits from an Asian barbecue sauce that combines both sweet and spicy flavors. A spicy marinade, as well as a mixture that features cumin, chiles, and lime juice, also complement this flavorful meat.